I used olive oil as a friend suggested. She says mayonnaise also works. You don't have to leave it on overnight, although I did - just to be safe. A few hours will do the trick. Comb out dead buggies with a lice comb, then wash hair and pick out remaining nits. 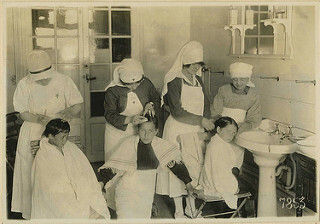 This treatment should be done on days 1, 2, 5, 9, 17, 19, and 21 - to coincide with the life cycle of the lice. Value added is it's not so hard on your drains when you wash it out. Each of my girls came down with lice at 9 years of age. 1st time I did the Kwell, etc., beauty shop, vinegar rinses-at end of a month got her a short haircut. 2nd girl, I contacted every old lady I knew and all said the same thing - 1/2 kerosene with 1/2 olive oil - I tired it on me 1st - no burn - leave on 5 minutes, wash off with regular shampoo. Hair is beautiful. No more lice ever again during their school years and I would always do this and braid their hair when the lice were reported in the schools. Interestingly, both are educators in the public school system.